This is the shortest day of the year and the official (at 6:04 a.m.) start of winter. Some of you may look at that first sentence funny. Feels like we've been in winter since the middle of November! Today will be a classic winter day...strong northwest winds with temperatures falling from the current reading of 30° during the afternoon. Wind chills will be in the teens. Overnight, we'll see temperatures drop to near 8° by sunrise on Monday, easily the coldest day of the season (Nov 22nd, we dropped to 16°)...take precautions with outdoor animals and protect your pipes. Monday's high only 27° under a sunny sky. Measured .34" of rain since yesterday which gives us 7.00" for the month of December. Our measurable precipitation streak stands at 6 days in a row. Unless we get measurable snow today (don't think we will), it will end. They'll have blizzard conditions today with nasty wind chills according to his 'latest post'. Looks like we'll have a typical early winter day here in Cookeville for Christmas. Highs in the mid 40's under a cloudy sky. Sorry kids and kids at heart. Hope this forecast changes! Michael - An interesting bit of Titan Weather Trivia that I came across from AccuWeather's Joe Bastardi: "Pit at Tennessee. 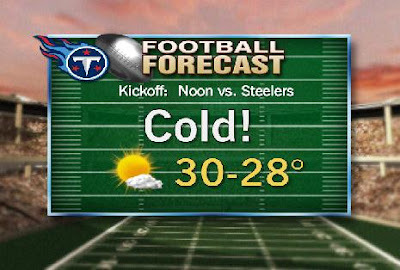 Coldest game in Titans history at home. Temps in 20s real feel single digits."